So what I did, was I started a lovely folder for Relationships! Here, I began to make files for relationships between my characters, to get the Web of Feelings going. This is when my plot really began to take off. Within each folder, I created four sections: History, Act I, Act II, Act III. For some of the characters, their history came easy – I just finished creating it in The Varken – for others, the history took more effort. Once I knew where characters where coming from (in general character sketches), I figured out how they meet this other person, how long they had known them for, what their first impression was and so on. If characters were to meet during The Blessed, I left History blank (of course, haha). Then, Act I! Okay. The story is just starting. For some characters, like Rhea and Atticus, this was the Act where they would meet, and so I needed to figure out first impressions, what draws these two together or apart. Rhea is my main antagonist, very manipulative and domineering. 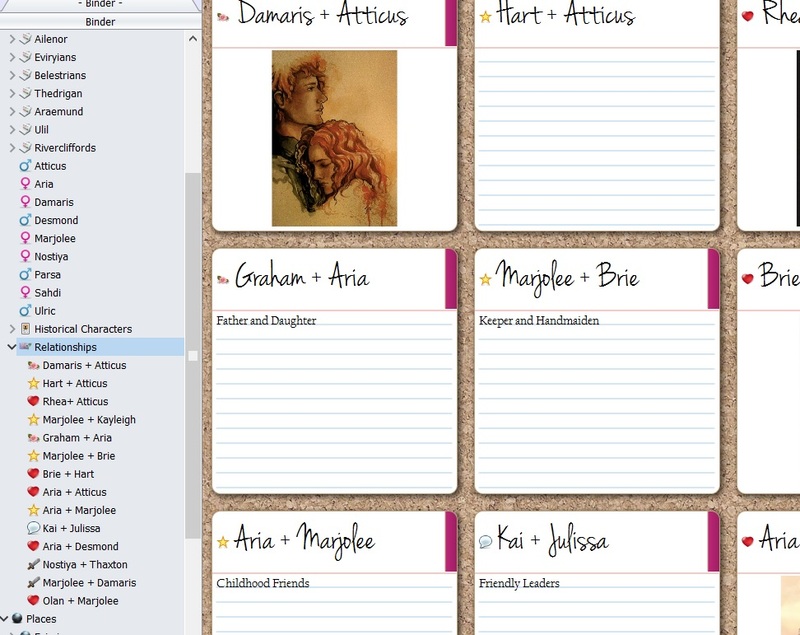 Atticus is arrogant, prideful and ambition. So how would Rhea affect him? This easily helped me figure out some of the details of how to get to Signpost #2, near the end of Act I. Both these characters are key in the over all story, but I needed to know how their relationship began in order to figure out how to get the plot moving. Damaris and Atticus are easily my favorite characters because of how I saw them grow into real people during this process. Act II, although it has little text, is a crucial turning point for Damaris’ character development. After figuring out how Atticus’ relationships with Aria and Rhea evolve, I discovered how Atticus’ character evolved. Then, I added Damaris to the equation and thought “How would she react to the changes in Atticus?” She is highly depending on her ‘brother’ and so changes in him would greatly affect her. I needed to figure out how. And that helped me unravel a way to build to Signpost #5. Olan and Marjolee were very interesting to discover, because they were very different characters before I put them together. Although Marjolee is a key competent to the over-arching story, she felt flat, and Olan was similarly uninteresting. But Marjolee needed to be a real person, and giving her a significant relationship really helped me to pull out the person within the character. This also gave me a lot of guidance for this other half of the novel that is separate from what is happening with Atticus. Confusing? Maybe. But this has been revolutionary in helping me develop a more complex outline than I have attempted before, with lots of different Points of View and a multitude of grey characters. I’m excited to really begin writing soon (and I hope I didn’t give too much away! ).